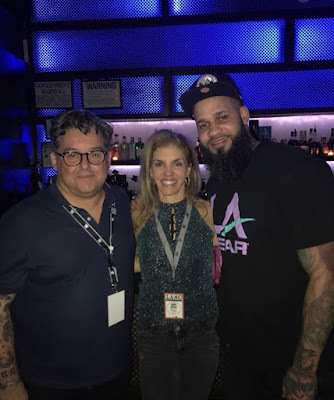 El B was invited to perform in New York City for his first time as part of the Latin Alternative Music Conference's (LAMC's) industry and fan showcase at Manhattan's City Winery, sharing the stage with artists Ana Tijoux, Flor de Toloache, Vega, Carlos Cros and more. The two-time Latin GRAMMY nominee, and leader of the Latin Hip Hop movement, included the premiere live performance of new material from his recently released album "Scorpion King Mixtape." During the conference, El B participated in a full media run with over 30 different media outlets that interviewed the outspoken Cuban, double Latin GRAMMY nominated artist. Media and alternative genre powerhouse outlets included Spotify, LATV, Vida Urbana, Latin Remix, Music Hunter and many more. of Latin Content and Programming, Leila Cobo.